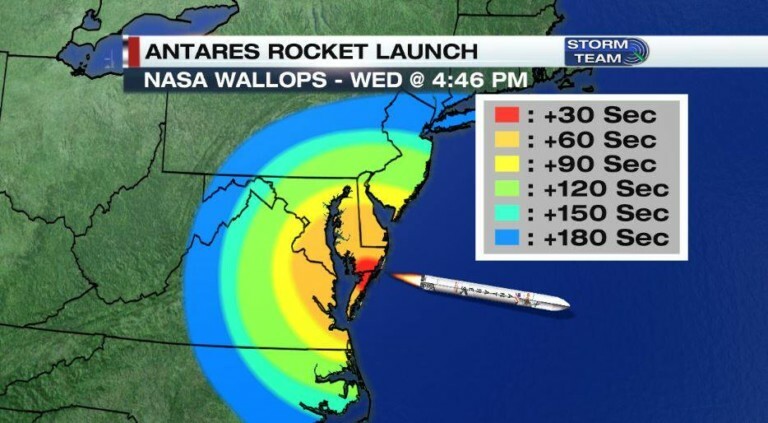 Try to carve out some time late Wednesday afternoon to step outside and watch Northrop Grumman’s Antares rocket launch from NASA Wallops Flight Facility! The rocket is carrying Northrop Grumman’s Cygnus cargo spacecraft to the International Space Station. It is set to launch on April 17 at 4:46 PM. The launch will be visible to everybody on the Delmarva Peninsula within 60 seconds of takeoff. Since this particular launch is occurring during the daytime, it may be more difficult for other areas around the Northeast and Mid-Atlantic to see the launch, but it’s still possible! Current forecasts are looking good for the day of the launch! Temperatures will be in the low to mid 70s inland, and mid-60s along the coast under mostly sunny skies.